As an Edmontonian, where do you buy your insurance? Home | Why Us? | As an Edmontonian, where do you buy your insurance? If a friend said, "You should buy your insurance from this Camrose company I know," you'd probably say, "Surely you're joking" to which he'd reply, "Actually I'm not…it's really worth your while." 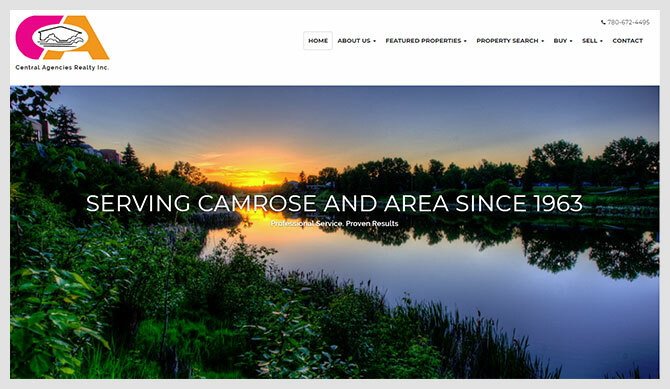 Central Agencies Inc. is a Camrose insurance firm, but they take care of the insurance needs of families and businesses in Edmonton, Calgary and places all over the map. Chances are you already know somebody who relies on this firm for automotive, residential, commercial or life coverage or other types of insurance coverage. Central Agencies began giving people a hand with their insurance (and real estate) needs back in 1963. Company founder Norman Mayer searched out insurance companies with proven reputations for offering highly competitive rates, diversified policies and quick claims service. Over four decades later, the Mayer family and their team of skilled, dedicated brokers continue to rely only on the companies in the business who match the original criteria. Central Agencies' interest in you doesn't end at 5 o'clock. Today, it's commonplace for insurance sales people to rely on their voicemail and answering machines not too long after the afternoon coffee break. You can expect a different level of service from the Central Agencies team. If an evening or weekend appointment suits your busy personal life or business schedule better, just let them know. A knowledgeable representative will meet you at your convenience. And isn't it comforting to know that if you have an accident, fire, or other claim on the weekend, you'll have the telephone or pager number of your Central Agencies representative to find out what to do next. Your Central Agencies broker will not quit shopping the market until they're convinced you're getting the absolute best value for your insurance dollar. Isn't it time for a change? Let us provide the service others promise. It's probably time to review your present insurance coverage. As your situation changes, so will your insurance requirements. Your insurance policy should be reviewed annually to ensure all limits and coverages are current. If it's time to make sure you're properly insured, its time to call Central Agencies in Camrose. It's always a good time to call. Please use our toll-free number – 1-800-809-8040.